Salty smoked salmon, bright fresh dill and creamy goat cheese combine to make an unforgettable Smoked Salmon, Dill and Goat Cheese Frittata. Some days, I write and write and write. I think Sunday was one of those days. But today, I just want to share a delicious recipe with you. 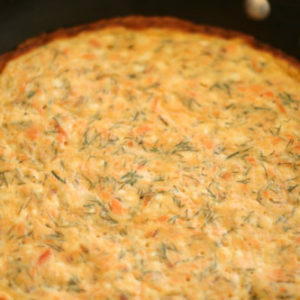 On Easter, I wanted a special Smoked Salmon, Dill and Goat Cheese Frittata to grace the table. I used the Joy of Cooking method, adapted slightly, to craft this recipe. Cate of Sweetnicks had suggested a similar frittata from Ina Garten, which sounded divine but had a few too many steps for me. So this is the simplified version with similar — but not the same — flavors. I made it with egg substitute to keep it a little heart healthier. And the goat cheese and dill are just perfect with the salty smoked salmon. This is a perfect brunch dish. Coincidentally, when I recently wrote about eating quiche for breakfast, I felt like the only one who considers it a breakfast dish after getting several comments about brunch, lunch and dinner. I guess I think eggs and that leads right to breakfast for me. Doesn’t anyone else make quiche for breakfast? What about frittatas? Can a Smoked Salmon, Dill and Goat Cheese Frittata be an any-meal dish? This recipe was adapted from one in the Joy of Cooking: 75th Anniversary Edition – 2006. Preheat oven to 350 degrees. Heat a 10-inch oven-safe skillet over medium. In a large bowl, stir together the egg substitute (or eggs), salt, pepper, smoked salmon, goat cheese and dill until well combined. Add the olive oil to the skillet and swirl around to coat all the sides. Pour in the egg mixture and cook without stirring until the bottom is set, but the top is still loose. Place the pan into the oven and cook for 10-15 minutes, until the stop is set. No need to let it brown -- you just want it firm. 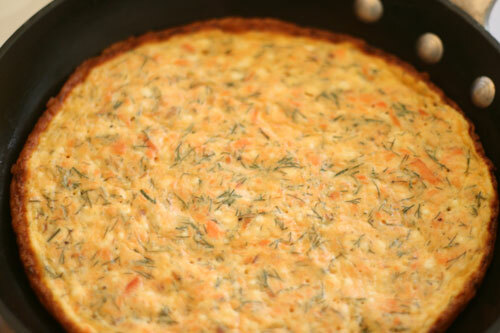 Now I’m craving a smoked salmon frittata – maybe this weekend. Gorgeous picture! That frittata look so delish, but I don’t think Billy would go for the salmon, he hates seafood. How do you make your dishes look so perfect??? This looks great. I made your other quiche to have on hand specifically for breakfast! It was the first time I ever made a quiche, which is weird, I’ve made tarts and all of that, but never a quiche. I will try this one too. I doubt if hubby will eat because of the salmon but I think it looks divine. A great way to use my new dill plant, too! Looks like a great way to start the day or enjoy for brunch, lunch or dinner! I tend to make frittatas and quiches for dinner simply because that’s when I have time in the kitchen. I always enjoy the leftovers for breakfast though! I definitely make frittatas for breakfast, but I tend to make quiche for later in the day — and then, if there’s leftover, I’ll happily eat it for breakfast. Love the combination of smoked salmon, dill and eggs; I often do a scramble of that. Absolutely perfect! And I am so on for that lunch date with you, Cate, Lydia, Maris, and Nika. Hopefully won’t be too long before I’m out there again.